In an environment where technology is constantly evolving and customer preferences can change rapidly, Caplin’s agile approach to project development enables banks to see a rapid return on their investment. The banking sector has a patchy record at best when it comes to implementing major technology projects. Despite massive expenditure on hardware, software and consultancy – research from Celent suggests that European banks alone spent more than $70bn on software and information technology in 2017 – institutions are often left unsatisfied with the end result. Lengthy implementation cycles are a significant factor in banks’ dissatisfaction with large scale projects, which is why Caplin’s preferred engagement model is to start small with a ‘lite’ proof of concept and analysis phase. This is commercially less risky than a full project while allowing for planning of the ‘main event’ and leaving the customer with working software and collateral that they can show around the organisation and use to build support for the larger project. Agile software development is not a new concept. The agile ‘manifesto’ was written in 2001 by a group of developers who suggested that producing working software was more important than creating mountains of documentation and that vendors should prioritise customer collaboration and the ability to respond to change. This approach allows new products to be brought to market more quickly and scaled more rapidly than under conventional development processes. Our projects are delivered in two-weekly ‘sprints’ with tight feedback loops for each cycle, which enable us to quickly identify what is working well and build on the elements of the project that are meeting the client’s objectives. The agile approach to development has been implemented across trading markets, enabling banks to test new products and get them in front of their customers in as little as a few weeks. Because the process is completed in such a short timeframe it is possible to demonstrate value very quickly. The key here is to focus on the highest value functions that need to be delivered. In many cases developers are asked to work on multiple projects simultaneously, even though the reality is that they will only ever be able to deliver a small fraction of these projects to completion. Another benefit for banks in adopting an agile approach is that they can quickly adapt the development process to reflect feedback from customers and react more rapidly to changes in the regulatory environment. This is vital in fast-moving markets where an application could be effectively redundant by the time it goes through the conventional development process – too much forward planning doesn’t always work! 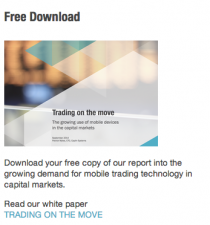 After some unexpected results in 2017, the latest survey of FX traders conducted by JP Morgan reveals a level of enthusiasm for mobile trading that more accurately reflects what we have seen in the field over the last number of years. JP Morgan has been in the vanguard of mobile FX trading. In that context, the findings of its 2017 survey – most notably, that fewer than one in three (31%) of FX traders were likely to use a mobile trading app – were surprising, particularly when stacked up against feedback from our inaugural FX survey. Our research underlined the fact that retail banking is far ahead of corporate and institutional banking in terms of using mobile app trading services to reduce the burden on hard-pressed sales teams, with most banks citing regulatory and compliance issues as the major obstacle to the adoption of the technology. However, the survey showed that the buy-side wants to go mobile and that the sell-side may be underestimating this appetite. We found that while most buy-side firms believed market participants were already demanding the ability to view and manage orders on their mobile, the majority of sell-side firms believed that demand would not reach this level for a number of years. Data from JP Morgan’s 2018 survey is more in line with our experience, with the number of traders expecting to use a mobile trading app more than doubling over the last 12 months. Almost two thirds (61%) now say they are either ‘extremely likely’ or ‘somewhat likely’ to use a mobile trading app this year. This figure is significant given that 34% of the traders surveyed said their company policy prevents any mobile use. Much is made of the perceived security and compliance concerns of mobile trading, but the reality is that trading through a phone app and trading remotely on a laptop are no different from a security perspective. Indeed, security and compliance concerns have forced mobile trading solutions to be even more secure. The effective implementation of mobile management systems requires mobile users in most firms to use secure passcodes to access their phones and secure login to an app using two-factor authentication provides additional assurance. Misplaced devices can be remotely wiped and mechanisms such as authentication patterns at the point of execution have largely eliminated unauthorised trading and errors. The key feature of mobile trading is undoubtedly usability – clients that prioritise advanced features and extremely competitive pricing are more likely to be drawn to multi-dealer channels or complex desktop offerings. The mobile experience is much more about making trading easy and convenient and building brand loyalty with corporate clients. Native notifications are also useful, helping clients stay on top of their positions and reducing the need for bank sales teams to call clients to let them know their orders have filled. Most of the discussion around MiFID II in an FX context has been pitched in fairly negative terms – yet the industry has much to gain from the clarity the directive will bring to the trading process. It is understandable that some market participants have viewed the implementation of the new rules with trepidation given that they are required to provide a greater degree of detail around their trade execution. However, it is also understandable that traders want to see the same level of transparency in FX that they see in equity or fixed income trading. We have seen that banks are using MiFID II to improve transparency around the FX trading process. By reporting on price construction and displaying cost to the client, the sales desk ‘owns’ this P+L to a greater extent. This is significant because banks are facing unprecedented pressure on costs. Margins are shrinking and as a result headcount is falling, so it is vitally important for FX sales desks to be able to justify their existence. One of the most effective means of underlining their importance is to improve efficiency. This can be achieved by getting clients to self-serve but having a management information system to demonstrate value and proactivity in increasing margin/wallet share. That means client trades can be attributed even if they are done on a self-service basis, increasing the visibility of eFX across the investment banking arm by highlighting the profitability of the sales desk relative to its modest headcount. Intelligent institutions are overcoming budgetary constraints, using the compliance budgets allocated to MiFID II to re-tool existing systems to the overall benefit of the user. In conjunction with the Global Code of Conduct, MiFID II has also created a more level playing field within the FX industry. The ability to demonstrate full compliance is vital to maintaining market credibility and will also serve to limit the impact of firms who have used technology to distort the market. In terms of Spot FX, all the major platforms delivered lower results in Mar 16. Second tier FX volumes reported weak volumes figures in Mar 16, with Hotspot showing a -19% fall to $26.4bn/day, whilst FastMatch reported a smaller decline of -9% to $10.1bn/day. Meanwhile the only top-tier platform to report is The CME group, which showed Mar 16 volumes for The CME of $114bn/day, down -4.2%. Full analysis of the top-tier platforms next week, by which time Reuters and EBS will also report their volumes as well. The charts below show the volumes comparisons between Hotspot and FastMatch. The bottom chart shows the gap between Hotspot and FastMatch. The Mar decline in Hotspot vols has caused the difference between the two platforms volumes to drop back from the top of the downward sloping channel. In terms of Spot FX, all the major platforms delivered lower results in Feb 16.